You are here: Home › Further Reading › JFK Assassination FAQs › Where Did Oswald Shoot President Kennedy From? Where Did Oswald Shoot From? Witnesses claimed that at least some of the shooting came from the Texas School Book Depository. A rifle and three bullet shells were found on the sixth floor. Lee Oswald was in the building during the assassination, but probably not on the sixth floor. and show that Oswald had actually fired at least some of the shots. Where Did the Shots Come From? Howard Brennan was standing opposite the TSBD, and saw a man with a gun in a sixth–floor window ( Warren Commission Hearings , vol.3, pp.143 and Warren Commission Hearings , vol.19, p.470). Geneva Hine was on the second floor: “[the shots] came from inside the building … the building vibrated from the result of the explosion” ( Warren Commission Hearings , vol.6, p.395). Patricia Lawrence was standing outside the TSBD: “I thought the shots had come from right over my head ” ( Warren Commission Hearings , vol.22, p.660). There was also strong physical evidence that shots had been fired from the TSBD. Three empty bullet shells, and a rifle, were found on the sixth floor of the building. The shells were matched to the rifle and to some, but not all, of the bullet fragments retrieved from President Kennedy’s car. Around 40 witnesses claimed that at least one bullet was fired from the direction of the infamous grassy knoll, about a hundred yards to the west of the TSBD, in front of President Kennedy. For details, see Grassy Knoll Witnesses. The Warren Commission in 1964 had been given the task of showing that the assassination was the work of one person, and that all the shots had come from one direction. Consequently, the Commission brushed aside the evidence of shots from the front. The House Select Committee on Assassinations in the late 1970s, however, accepted that at least one shot had been fired from behind the fence on the grassy knoll. There are no undisputed photographs of anyone firing a gun from any location in Dealey Plaza during the assassination. There are, however, three home movies that show President Kennedy reacting to a bullet fired from the general direction of the knoll. The films, by Abraham Zapruder, Orville Nix and Marie Muchmore, show JFK’s head moving sharply back and to the left immediately after the fatal head shot. One of the doctors who treated President Kennedy at Parkland Hospital announced in a press conference that Kennedy’s throat wound was caused by a shot from the front. The matching bullet holes in Kennedy’s jacket and shirt, coupled with the only contemporaneous written account of the autopsy, show that one shot hit the president in the back. Lee Harvey Oswald’s own account of his whereabouts no longer exists. He spent just under two days in police custody before he was shot dead in the police station basement. During that time, he was interviewed for around 11 hours, and was surely asked about his precise location at the time of the shooting. Because the Dallas police did not take the trouble to use either a tape recorder or a shorthand secretary, the only records of Oswald’s interrogation are the partial accounts written by his interviewers some time after the event. It appears that he claimed to have been on the first floor of the TSBD at the time of the assassination; see Lee Harvey Oswald’s Alibi. Howard Brennan’s description of a gunman on the sixth floor of the TSBD roughly matched Oswald’s appearance, but two other witnesses claimed that the gunman did not look like Oswald. Brennan failed to identify Oswald as the gunman when he saw him at the police station later that day. For details, see How Did Oswald Shoot JFK?. A fellow employee of the TSBD, Carolyn Arnold, claimed to have seen Oswald on either the first or second floor at the same time as the gunman was seen on the sixth floor. It has been claimed that a well–known photograph shows Oswald standing on the front steps of the TSBD during the shooting, but the man in question was almost certainly Billy Lovelady, a colleague of Oswald’s. Two news films, however, show a man who may well have been Oswald, standing in the shadows of the TSBD’s main entrance; see Who Is ‘Prayer Man’?. 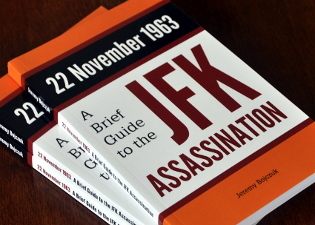 For a detailed account of Oswald’s movements at the time of the JFK assassination, see Howard Roffman, Presumed Guilty: How and Why the Warren Commission Framed Lee Harvey Oswald , Fairleigh Dickinson University Press, 1975, pp.209ff (available online at http://www.ratical.org/ratville/JFK/PG/PGchp8.html). Did Oswald Fire the Shots? Since Lee Harvey Oswald was almost certainly somewhere inside the TSBD during the JFK assassination, he cannot have had anything to do with the shot or shots that were fired from in front of President Kennedy. Nor, as it turned out, did Oswald have anything to do with any of the shots that were fired from behind the president. The Dallas police tested his skin for evidence of gunpowder residues, and discovered that there were no incriminating quantities of such residues on his right cheek. Their finding was confirmed by the Atomic Energy Commission’s neutron activation analysis, which also demonstrated that the rifle Oswald was supposed to have used would certainly have left such deposits. In the words of an unpublished Warren Commission memo, “At best, the analysis shows that Oswald may have fired a pistol, although this is by no means certain. … There is no basis for concluding that he also fired a rifle” (Memo from Redlich to Dulles, 2 July 1964, Investigation and Evidence File, RG 272, Series 12, box 4, folder 3, National Archives). For details, see Oswald’s Rifle and Paraffin Tests. In short, Oswald almost certainly did not shoot President Kennedy from anywhere.